Did you all know that yesterday was national cranberry day? I didn't know that so I will be making note of that for next year. We love cranberries and I am super excited to share this guest recipe with all of you today. Jenny Engel and Heather Goldberg of Spork Foods have created a delicious Pistachio Cranberry Sauce recipe that is easy to make and perfect for Thanksgiving and the upcoming holiday season! The recipe is nutritious, gluten free, vegan, and something you will want to make all year long. To prepare the dish even faster, substitute the pistachios and dried cranberries with four Pistachio Chewy Bites. Simmer covered until berries burst and sauce thickens, stirring occasionally, about 10 minutes. Remove cinnamon stick and add in diced pistachios and dried cranberries. Cook about 1-2 minutes uncovered and remove from heat. Serve warm or allow to cool, then refrigerate sauce over night. 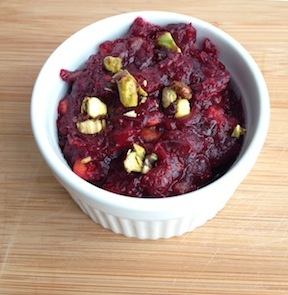 Pistachio cranberry sauce can be made up to 3 days ahead. Disclosure: Recipe and photo is copyright Spork Foods. This recipe sounds delicious. I never thought to add dried cranberries and pistachios to a cranberry sauce. Perhaps I shall try it for Christmas.